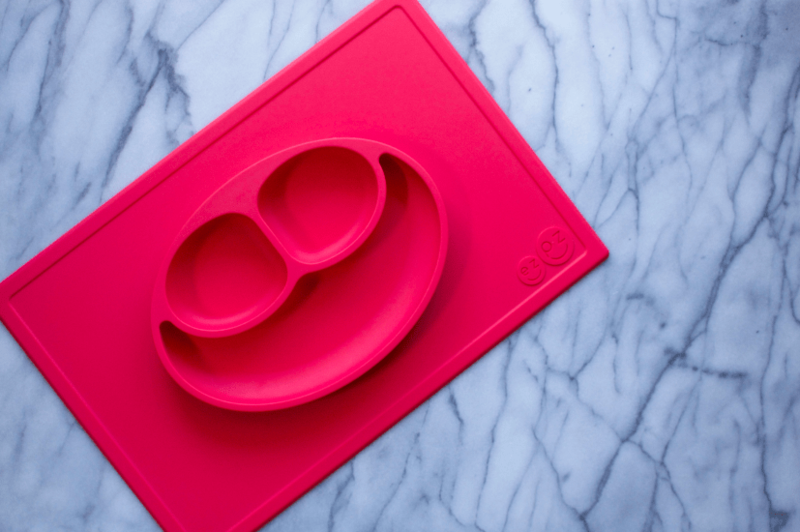 My review of the Ezpz Happy mat, a silicone toddler plate that sticks to your table. When I first started looking, non-plastic baby dishes were hard to find. I considered some wood and metal options, but ultimately found silicone dishes most compelling for their durability and versatility. I purchased one silicone ezpz Happy Mat and we use it for all three meals. Using this clever mat makes mealtime with my toddler simple and clean up easy. Is the Ezpz Mat Easy To Clean? The ezpz Happy Mat is a dish and placemat in one. With its large surface area, the mat contains most of my child’s mess. We pull her right up to the table with us (she sits in a Stokke Tripp Trapp chair) and place the mat directly on our tabletop Sure, yogurt and mashed sweet potatoes get all over the mat, but they rarely make it past the placemat portion of the mat. This significantly reduces clean up. Amazingly, the Happy Mat suctions to the tabletop so toddlers can’t throw their plates! This doesn’t entirely prevent food throwing (which is why I’ve placed a Gathre mat beneath the highchair) but seems to minimize this problem quite a bit. Because of the Happy Mat, my child has never been able to fling a full bowl of food across the room. Silicone is also extremely easy to clean. The Happy Mat is dishwasher safe, but it’s also very easy to hand wash with soapy water. I love having only one surface to wash after every meal. After each meal I simply wash and dry the mat so that it’s ready for the next use. How Big Is The Happy Mat? The Happy Mat measures 15 X 10 inches and does not fit on most highchair trays. I don’t mind this because I prefer having our child simply join us at the table. And frankly, I love not having to wash a clunky high chair tray! If you’re looking for a smaller mat that will fit a highchair tray, the ezpz Mini is a better option for you. The Mini is also recommended for travel. The Happy Mat is suitable for children 6m+, but the portion sizes are designed with toddlers in mind. The “eyes” portion of the happy mat each hold 4oz, while the “smile” portion holds 10oz. If you’re looking for non-plastic baby dishes, you will find several wood and glass options. There are also other companies producing silicone baby dishes. I chose the Happy Mat for its unique design that combines a traditional sectioned plate with a wide placemat. I’ve already discussed some of the benefits of silicone, but it’s also worth mentioning that since the ezpz Happy mat is made of high quality silicone, it is BPA, BPS, PVC, latex and phthalate free. One of my concerns about buying non-plastic baby dishes was that some non-plastic materials (such as traditional glass and ceramic) are more likely to break. Silicone is a safe, durable material built to last. I love the cheerful design of the Happy Mat! The smiley face compartments are cute but still completely functional. You can buy the Happy Mat in bright and muted colors. I chose bright coral. Did you know that bright colored objects appeal to young children whose eyes are still developing? Read more about that here and here. Is The Ezpz Happy Mat Worth The Money? One ezpz Happy Mat costs $25. This can seem like a lot of money, unless you consider how many different plates, bowls, and place mats you might buy (and replace!) in the lifetime of one Happy Mat. 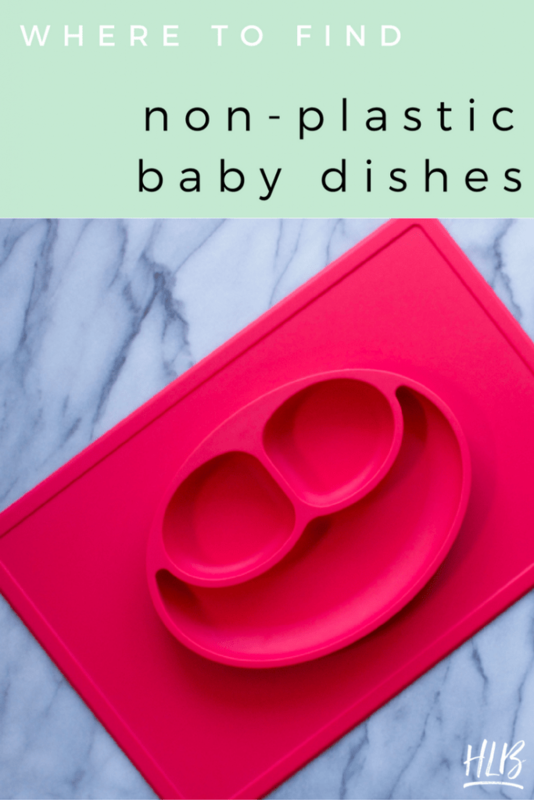 If you are interested in non-plastic baby dishes, you are interested in everyday items that are durable, dependable, and long lasting. With one child, I only need one Happy Mat. This has allowed me to take a simple approach to toddler feeding supplies overall. 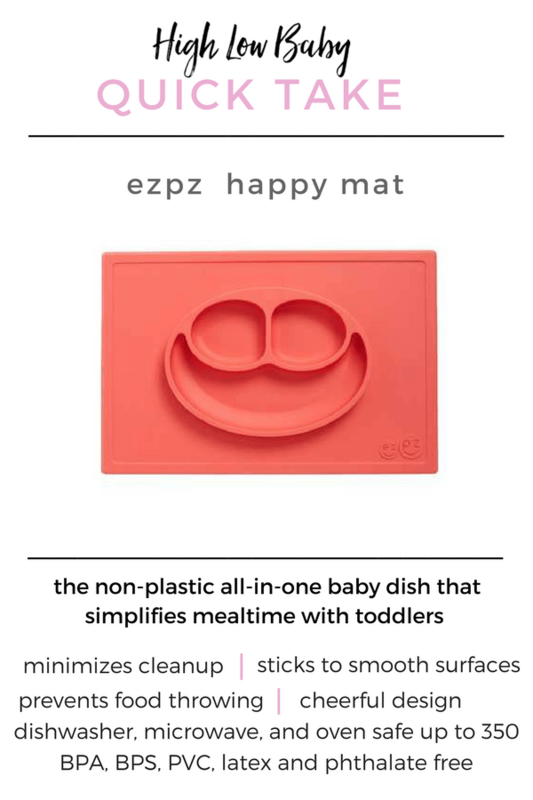 The ezpz Happy Mat has helped me simplify toddler meals by minimizing clean up and reducing the number of feeding items cluttering my kitchen cupboards. « Oeko-Tex Certified Crib Sheets on a Budget!